See the related experiment that we did. 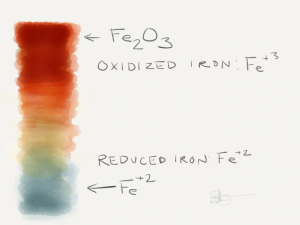 Color changes in Iron with valence. Some seed ball instructions argue that red clay is a must for seed balls, this just isn’t the case. Here, I’ll discuss factors that affect the color of clay and how those factors affect germination. Clay is a mineral, and can have varying amounts of iron in it. As a matter of fact, above all other minerals, iron affects the color of soil most dramatically. When iron is oxidized, it makes rust, which can impart a rusty orange-red appearance on soil and clay if present in large enough amounts. This is not at all uncommon. When iron is oxidized, it is an insoluble solid material and tends to stay put in the clay or soil substrate. It is often referred to as ferric iron. Iron migration in natural sandstone from Pennsylvania. Because ferrous iron is soluble, it can leach out of clays, soils, and minerals. As soon as the soil dries out, however, it will oxidize and can leave a distinctive rusty red ring. It can also leave a neutral grey spot that is without iron in the region where it was leached. The rock to the right is a piece of sandstone that was exposed for 1000s of years to a fluctuating water table. Over time, the redox conditions moved all the iron to one side of the rock, where it clogged all the pores making a dense dark red stone, contrasting with the more neutral colored porous sandstone. I found this rock in Central Pennsylvania near Lock Haven. Iron migration from a wire in moist art clay. You can turn a red clay into blue-green clay by adding water and anaerobic microbes. If a clay has no iron, it will appear gray regardless of its redox state. There is no iron to give the mineral a redox-indicating color. On the right, with the yellow background is some pottery clay that I used for a sculpture, in which were embedded some iron wires. The sculpture was kept moist for months while I was working on it, mobilizing the iron from the wire and into the clay. 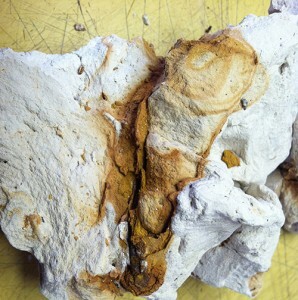 When the sculpture was allowed to dry, the ferrous iron in the clay quickly oxidized, making the clay orange. Manganese can form purplish-black nodules through a similar process of redox induced migration, but those occur less commonly. And what about my seed balls? If you purchase dried, powdered clay, it is in an oxidized state. If is dry, powdered, and grey, it just is depleted of iron, which isn’t a big deal if you are supplementing with compost. Moist red clay has no anaerobic microbes in it, so there is nothing to force the reduction of the iron. The oxidation-reduction reaction (aka redox) of soil materials is reversible and surprisingly rapid geological process: weeks, not epochs. You shouldn’t use actively reduced clay for your seed balls; the ferrous iron will act like an oxygen sponge and will absorb it before your seedling’s roots can. But don’t toss your clay!! 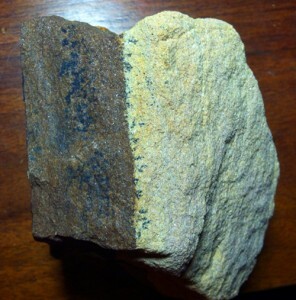 If you think your clay is reduced (green, blue, or has a stink*), just break it into smaller pieces and let it dry out, the oxygen will quickly oxidize the Fe+2 (if present) and give it the distinctive rusty blush – or not if it lacks iron. Then slake it down and make your seed balls. No need to toss your gleyed or clay, just let it breathe, your seed balls will be just fine. One other note. Iron in its red, ferric state (Fe3+) is not taken up by plants. It needs to be ferrous (Fe2+) to go into solution and then be available for plant uptake. The red iron in your clay will not be particularly useful to plants unless it is reduced. Seedlings can get iron toxicity, as well, but have mechanisms for functioning in a range of iron concentrations (Connoly & Guerinot 2002). *The stink is the result of other anaerobic redox processes that produce methane and hydrogen sulfide.If these are produced, your iron is definitely in a reduced state and you need to dry out that clay, but you can still use it!